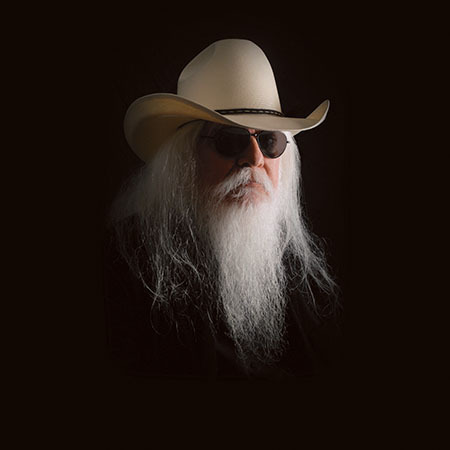 NASHVILLE, Tenn. (November 13, 2016) – Leon Russell, born Claude Russell Bridges, who sang, wrote and produced some of rock 'n' roll's top records, passed away Sunday, Nov. 13 at the age of 74. Leon’s last performance was July 10 in Nashville. Known as "The Master Of Space And Time," Leon was a legendary musician and songwriter who performed his gospel-infused southern boogie piano rock, blues, and country music for more than 50 years. Leon, born in Lawton, Okla., began as a nightclub piano player in Oklahoma at the age of 14, also backing touring artists when they came to town. Jerry Lee Lewis was so impressed with Leon that he hired him and his band for two years of tours. As a musician, primarily a pianist, he played on The Beach Boys' "California Girls" and Jan and Dean's "Surf City." Leon also played guitar and bass. He recorded hit songs himself like "Tight Rope" and "Lady Blue" and participated in "The Concert for Bangladesh." John Lennon, Ringo Starr and George Harrison played on his first album, Leon Russell. His concerts often ended with a rousing version of "Jumpin' Jack Flash." In 1973, Billboard listed Leon as the top concert attraction in the world. About this time, he was the headline act on billings that included Elton John and at other times Willie Nelson. In a 1992 interview with The Associated Press, Leon said music doesn't really change much. He and Elton John released The Union, a critically received duo album in 2010. Besides his music, Leon was known for his striking appearance: wispy white hair halfway down his back and that covered much of his face. Leon relocated to Los Angeles in 1959, where he became known as a top musician, and later to Nashville. In the early 2000s he began his own record label, Leon Russell Records. Leon was inducted into both the Rock and Roll Hall Of Fame and the Songwriter's Hall of Fame in 2011. For more information on Leon Russell, visit leonrussellrecords.comor visit his official Facebook page.